It’s been awhile since I’ve seen something as unique, intriguing, and downright cool as the Hyperbolic Crochet Coral Reef Project, which was introduced to me not by the significant number of knitting and art bloggers that featured this bit in the past, but by one of the dean’s at my school who rightly figured I’d be interested in this convergence of science, math, and welp, crochet! The brilliant project is the brainchild of artist Margaret Wertheim and her twin sister; originally, the techniques of hyperbolic crochet was discovered by mathematician Daina Taimina, who realized hyperbolic geometry couldn’t be visualized in any way (not even on computer) but by knitting (heck! too many stitches on the needles) and then crochet (ah easier with those stitches!). 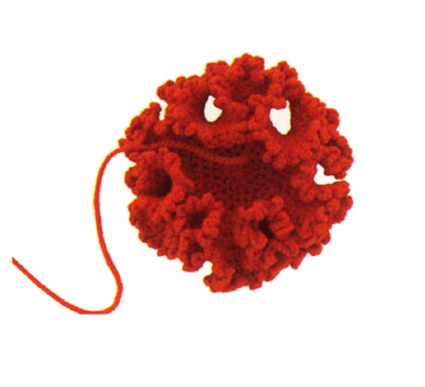 But since then, the sisters have expanded upon this hyperbolic crochet by not only creating the visualizations of the math, but by highlighting a strong relationship betwixt ecology, marine biology, environmental activism, feminine handicraft, and assorted math. Of course, my introduction to the project came via the TED Talk Margaret Wertheim, who uses the crochet models to help the masses contextualize and visualize complex mathematics, recently gave at the famous conference of ideas. Coolsies. The coral reef models created are stunning; absolutely breathtaking. What’s more, 90% of the models have been created by women. I’ll definitely be introducing these amazing fiber structures to my knitters in school–its brilliant, really. While I’ve never been much of a mathematician, knitting and crochet has certainly improved my skills much more than my years sitting in calculus and algebra. So if you struggle with math, perhaps take up a handicraft! It helps by allowing you to use the equations in a real world way. Plus, once you start to really understand patterns, charts, and the way stitches, counts, and the like effect the shaping of a project with expert knitting, you’ll begin to tackle the math of the entire endeavor even more. File Under: Should I make my own? And more importantly, how badly do I want to peruse this book?! Previous Box o’ modely snaps? Next Mashing up the knitters!